Uniquest is a recognized and respected leader and innovator in the distribution of electronic components. We provide an exemplary standard of products, services, and solutions to best suit the concerns of our customers. The vast variety of consumer electronic products is being constantly driven by new developing technologies and the consumers’ unlimited desire for the latest and greatest. This market is a moving target and requires sharp foresight into emerging trends and the ability to keep track of and be in step with the market’s constant evolution. Innovators and manufacturers of tomorrow’s products are more cautious about selecting the right distribution partner than they were in the past. This is with good reason, as the success of their business depends on the most compatible partnership. Uniquest has earned a highly respected position in this market by consistently delivering the services, products, and support that customers want and need. 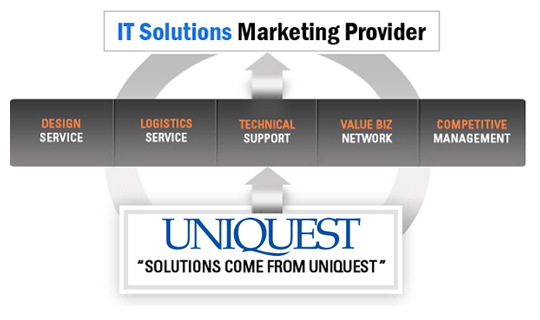 What sets Uniquest apart from other distributors is our commitment to our customers’ success by providing an extensive knowledge of their technology and other value-added services needed in order to truly promote customer support. The result is cost-efficient, rapidly delivered, technically superior products that customers can take pride in.